Andrew Hanauer is the Campaigns Director and Eric LeCompte is the Executive Director of Jubilee USA Network, a coalition of 75 national organizations and 400 faith communities advocating for economic policies that benefit the most vulnerable. 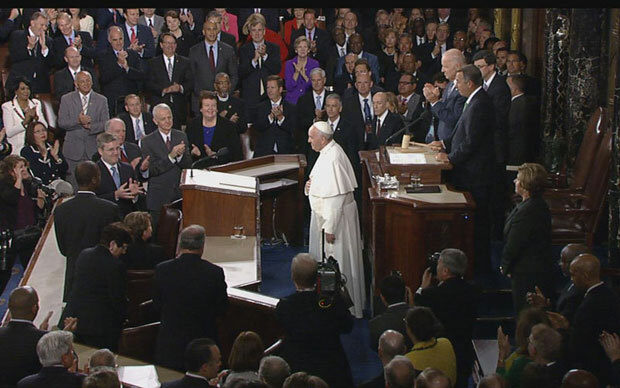 LeCompte attended Pope Francis' speech to Congress this morning. www.jubileeusa.org. WASHINGTON, Sep 24 2015 (IPS) - Pope Francis delivered two very strong messages in his speech to Congress Thursday morning: let’s work together and let’s protect the vulnerable. Those are fairly non-controversial comments. Both messages received standing ovations from both sides of the aisle, the type of ovations Presidents rarely receive during a State of the Union address. This is an important statement in a city gripped with partisan gridlock and amidst a Presidential campaign not known for its civility. It’s tempting to divide those two messages – work together, help the needy – into separate items, two easy things to check off society’s to-do list. Be nice. Help others. But this Pope was saying so much more. Francis’ message was that if we don’t work together, we can’t help the vulnerable. That each and every one of us must contribute to a world built on “hope and healing…peace and justice.” He said that “the challenges facing us today call for a renewal” of a spirit of cooperation. Getting along with each other isn’t just a nice thing to do, it’s our moral duty because the most vulnerable are counting on us. Francis is clear about the challenges we face. Poverty and inequality are at the top of the list. Since he became Pope, Francis has skillfully and specifically connected religious teachings on poverty and compassion to the actual debt, tax and trade policies that shape our global economy. He criticized tax avoidance to dignitaries from known tax havens. He called for a global bankruptcy process for countries in response to the Greek debt crisis. He criticized austerity by name, labeling it bad for the poor. In his speech to Congress, Pope Francis talked about “unjust structures.” He didn’t label them, but anyone who listens to Pope Francis speak on a regular basis knows what he’s talking about. It’s no mistake he’s talked about “an economy” of inclusion or exclusion. He recognizes that whether or not the most vulnerable have enough money to feed their families is the direct result of economic policies formed in capitals around the globe. We all have a role in shaping that economy. And when we work together, we can shape it for the better. Our organization, Jubilee USA, was founded by religious leaders and Pope John Paul II to shift those very economic policies. We’ve won USD130 billion in debt relief for the world’s poorest countries – money that reduced child mortality rates, built schools and clinics, waived health fees for rural Africans and more. We won this relief because Republicans and Democrats worked together. From George W. Bush to Barack Obama, from Pat Robertson to Jesse Jackson, we forge broad consensus. It wasn’t inevitable. World Bank President Jim Kim recently noted that when the Jubilee movement began in the late 1990’s,‎ nobody thought it would succeed. But because we worked together across political divides – now Kim attributes the debt relief work of Jubilee as a primary reason for economic growth on the continent. We’ve got more big challenges to overcome. More than one billion people live in extreme poverty. Debt crises are spreading, from Greece to Puerto Rico to El Salvador. The developing world loses nearly one trillion dollars each year to crime, corruption and tax evasion, money that could be building schools and hospitals in the world’s poorest countries. Pope Francis noted in his speech that these very structures not only cause poverty, they fuel conflict and instability. Congress has plenty it can do to help, but will be most effective if they can achieve bipartisanship. Take, for example, the fact that the US is one of the easiest countries in the world in which to create an anonymous shell company to move dirty money around the world. Criminals use anonymous shell companies to scam Americans, steal from developing countries and even fund terrorism. Legislation in Congress could change that – and it will only advance with support from both parties. When Pope Francis encourages all of us to work together, both Democrats and Republicans should take note. Pope Francis did not deliver a liberal or conservative message. He delivered a message about putting people first – and putting the most vulnerable at the very center – of our political, moral and spiritual lives.